Customer service isn’t what it used to be thanks to social media. And for consumers, that’s a good thing. Nobody has time to sit on hold for an hour or spend days stuck in an endless email chain to get their questions answered anymore. Fast forward to present day where time is of the essence. According to Sprout’s 2018 Social Index, nearly half of all consumers have taken to social media to raise questions and concerns to brands. And a bulk of that back-and-forth happens in the Twitterverse. That’s why having a concrete Twitter customer service strategy is a must-have for brands who want to keep their customers happy. Although Instagram and Facebook may be the most pressing networks for marketers right now, Twitter remains one of the top avenues for customer service. In fact, our data shows that 21% of consumers prefer Twitter to traditional customer service channels. Consider for starters that customer service on Twitter is short and to the point. The platform’s character limit keeps people from mincing words. In short, Twitter encourages you to immediately get to the root of any potential issue. Additionally, anything that happens on Twitter is in the open for the world to see. This means that there’s a microscope on brands as how they treat inquiries is totally front-facing. 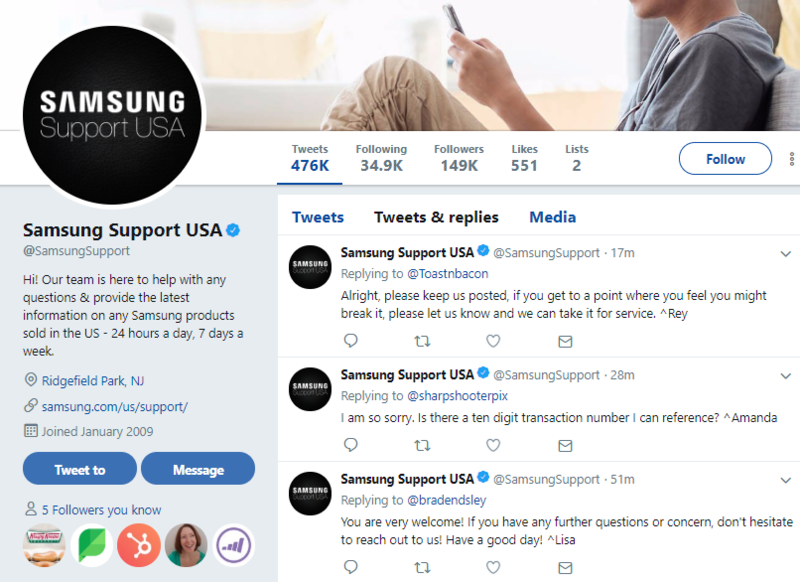 To help your business maintain a smiling face and keep customers from bouncing to competitors, we’ve highlighted the must-haves for an effective Twitter customer service strategy below. Reality check: if you’re haphazardly replying to mentions and interactions with customers, you’re going to have a tough time. Let’s say that a couple of customers totally put your brand on blast. Who’s going to respond to them? Who have you already spoken to? How do you know who you’ve @’d back and who you haven’t? This is why having a dedicated Twitter dashboard is a total lifesaver. Don’t lose customers due to lack of organization. 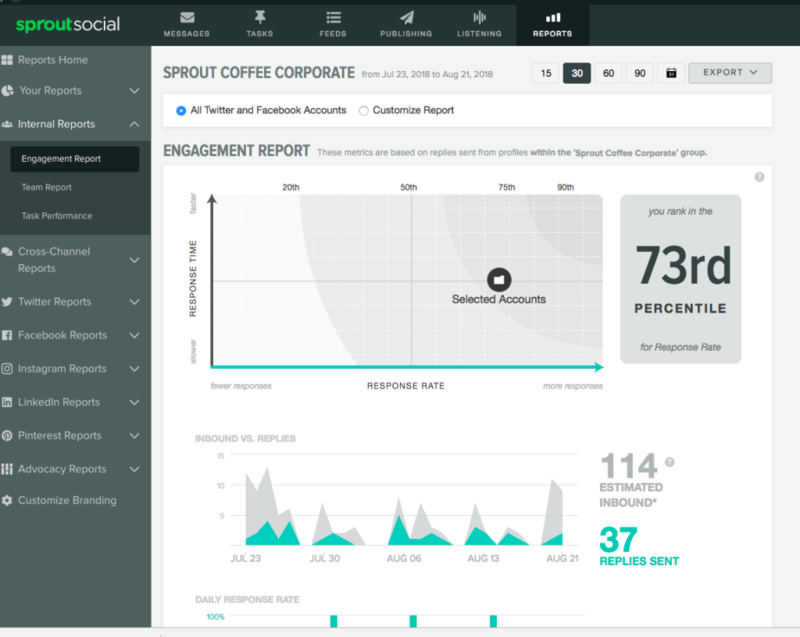 With a Twitter dashboard, you can track individual interactions with customers in real-time. This means that not only does no mention go unnoticed, but you also have a bird’s-eye view of your Twitter customer service in one place. 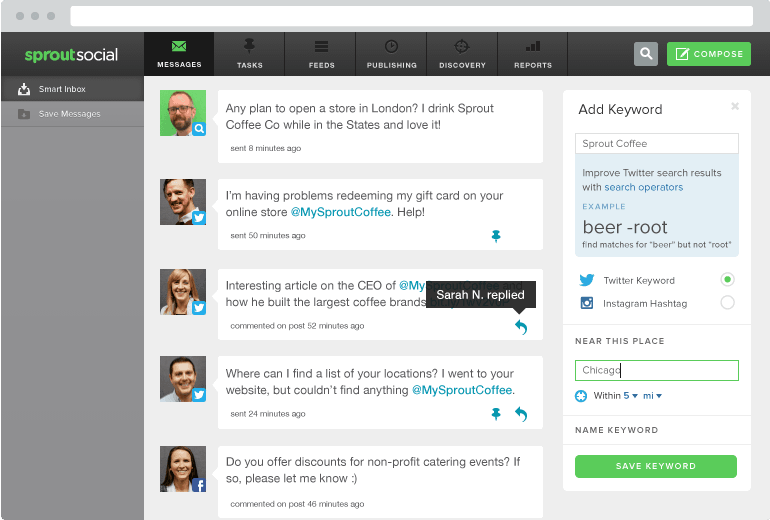 Features such as Sprout’s Smart Inbox track conversations on Twitter in addition to your other social channels. This ensures that you effectively “close” any customer concerns, all the while holding you or your team accountable for doing so. Speaking of accountability, consider also how you can measure the effectiveness of your Twitter customer service efforts. Metrics like sentiment analysis let you know how people feel about your brand at large whether that sentiment is positive, negative or neutral. This sort of infrastructure helps ensure timely, thoughtful responses rather than customer service chaos. Although some customers might show you some love via Twitter, expect to spend more time addressing questions and concerns. And yes, doing so might require dealing with criticism. Responding with grace is the difference-maker between winning over a customer or losing them for good. And while there might be some trolls out there, brands should give negative feedback their full attention. Your responses both reflect on your company and determine whether or not your customer sticks around, after all. 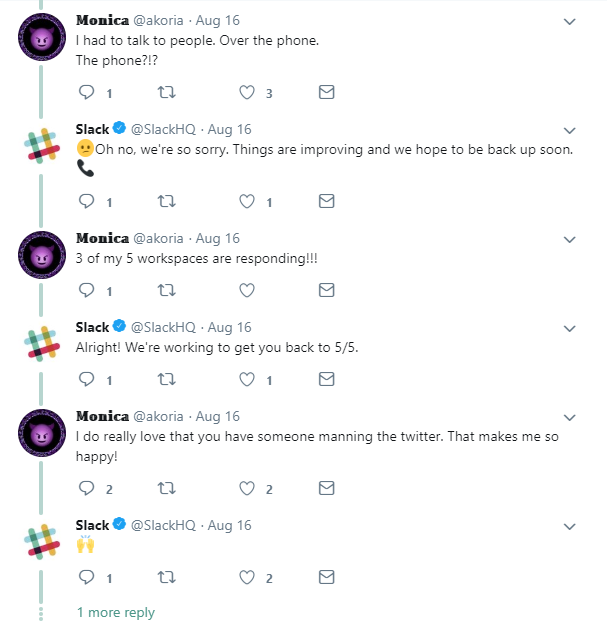 For example, check out how Slack was forward with their followers during a recent service outage. Their openness and ability to follow through actually won them some brownie points with their customers. The takeaway here is that brands shouldn’t shy away from calls-outs or negative feedback when it happens. Timely responses and empathy are your best bet for keeping people around despite their frustrations. Again, the beauty of Twitter customer service is that it’s short and to the point. Yet sometimes it may be the best place to start a customer service inquiry rather than have a full-blown conversation. On one hand, brands should strive to keep answers simple and remain on Twitter for the sake of convenience. On the flip side, some issues might just get a bit too complex and 280 characters just won’t cut it. Taking the conversation to your Direct Messages is a smart move, giving you up to 10,000 characters to respond privately to issues. However, you might need to go in even more depth or pass off the concern to someone else. In this case, asking for someone’s email via Tweet or DM is fair game. Just make sure whatever you’re passing off via email is prioritized and not left sitting. Taking people off Twitter is fine, but not when their customer service journey feels like a wild goose chase. As long as you’re keeping their concerns moving and getting to the root of the problem, you’re golden. Even if your tweets are only meant for your customers’ eyes, they’re still out there for the world to see. This is good news for customers who want to hold brands accountable. That said, this removes the sense of privacy afforded by phone or email support. Much like the last tip, it’s important to know when to go beyond tweets, and dealing with private information is exactly the sort of situation we’re talking about. Always be sensitive to customers’ personal information and assure them you’re authorized to handle these types of details as early as possible. If you have multiple employees handling your Twitter customer service, you need a way to track who is responding to each tweet. The benefits of signing your tweets are two-fold. Doing so creates a sense of accountability and allows you to track interactions between your team and your customers. Additionally, it gives your Twitter customer service efforts a much more human vibe. Whether it’s your employees’ names or initials, a simple signature serves as a personal touch. 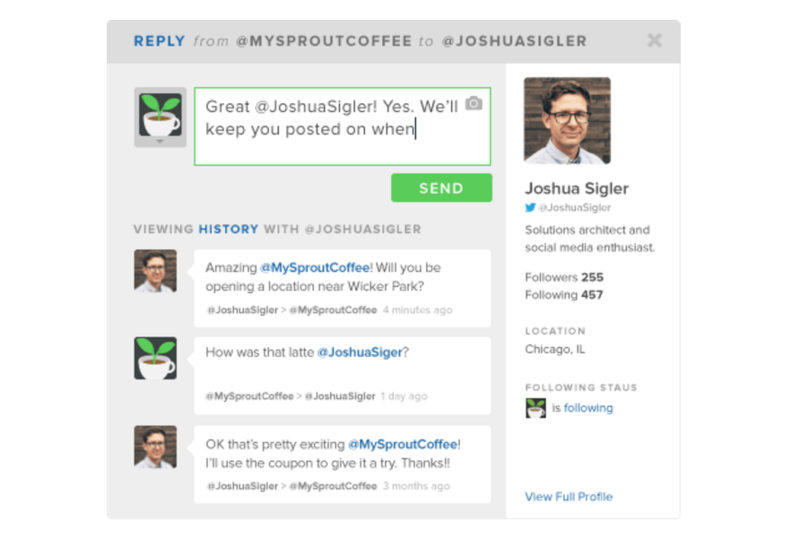 Sprout’s built-in social media CRM features make it a cinch to track your team members’ interactions with customers. When a user tweets your company with a question or concern, you can assign the tweet to a specific member of your team. This way you know who’s in charge of replying and resolving the issue without second-guessing. According to Twitter’s own data, 60% of users expect a response within an hour of reaching out to a business. Compare that to the expected twelve-hour response time via email and it’s clear that social customers expect speedy service. While you may not be able to respond to each and every question at a moment’s notice, speed counts. Quick responses signal that you’re a brand that listens to customers and likewise values them. Here’s a recent example of GameStop personally responding to a positive mention within 10 minutes. How’s that for speed? Response time is one of the most pressing metrics for Twitter customer service. An oft-cited Twitter study on airline companies found that customers were willing to spend more with companies who responded fastest. This again reinforces the need for a Twitter dashboard. 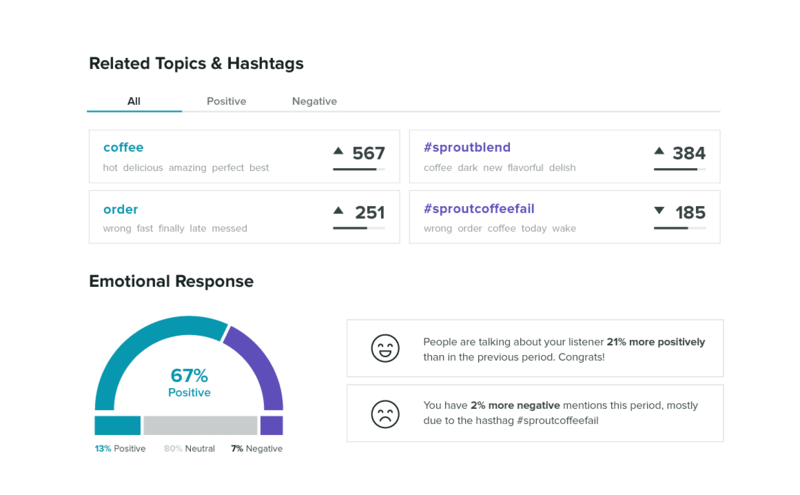 For example, you can check how long it takes you to respond to tweets within the dashboard using Sprout’s engagement report. This shows both your response time and rate, helping you to further refine your Twitter customer service strategy. If you don’t have a streamlined way to monitor your brand mentions, providing customer service becomes an uphill battle. The sooner you know that somebody has given you a shout-out, the quicker you can respond. For many businesses, monitoring brand mentions on Twitter begins and ends with checking their notifications. However, Twitter notifications only give you a partial picture of your Twitter presence. Companies today understand that you can’t put just customer service on autopilot. And while you may be tempted to take a copy-and-paste approach to your Twitter customer service, think twice before doing so. People might be willing to deal with automated systems on the phone but not on social media. The appeal of turning to Twitter instead of traditional customer service avenues is that you can get a quicker response from a person. You know, a real, flesh-and-blood person. Twitter is the perfect platform to be more personable with your support. There’s no expectation to be formal, meanwhile the limited character count encourages you to be more conversational. And while you want to maintain some sense of professionalism, don’t be afraid to let your sense of humor shine if it’s in line with your brand’s voice. Ever walked into a store and had an employee greet you by your first name? It’s the sort of service that makes you feel like a VIP, all the while reinforcing that the business you support actually cares about you. Why not provide your customers with that same sort of treatment on Twitter? Sprout has a built-in feature that makes this process much easier. You can add notes to any Twitter user you interact with and share those notes among your entire team. Being able to quickly check your prior conversations or special preferences for a customer allows for yet another opportunity to provide more personal service. Finally, remember that customer service is about more than just answering questions or dealing with problems. We live in an era where customer expectations are sky-high and brand loyalty is fierce. This interaction with Instant Pot is a prime example of going the extra mile. This customer probably didn’t expect a response from the brand themselves, but that’s exactly what they got. They also received a helpful, specific piece of content that gets to the heart of their question. Brands should strive to go above in beyond to help customers while also reminding them just how much they matter. If someone posted a picture of your brand or product, why not show some love with a retweet? And if someone left you a positive mention, let them know you’re listening. These small touchpoints are critical for creating a stronger sense of brand loyalty. Being attentive and authentic with your customers can be strong marketing firepower if you’re consistent. What Does Your Twitter Customer Service Strategy Look Like? Want to provide personalized, speedy service to your customers? Look no further than Twitter. Going beyond traditional avenues of customer service is a must-do for brands today. By offering up savvy social service backed up by a strategy, you can use your interactions on Twitter to retain current customers and drum up new ones. We want to hear from you, though. Do you currently provide customer service via Twitter? Any stories you want to share? Let us hear ’em in the comments below!